Gross area: 24.7 sq. ft.
Net aperture: 21.5 sq. 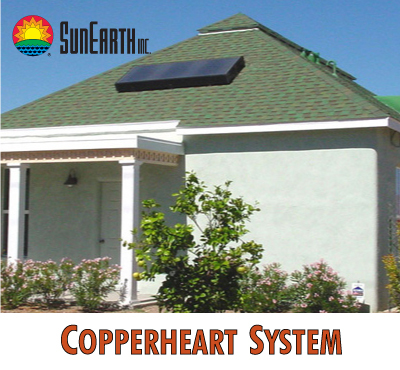 ft.
CopperHeart Deluxe/2-Way Kit – Use in conjunction with a conventional water heater, or an instantaneous water heater. of-use. The water heater must remain turned on to provide backup heat as required, and to maintain a ready supply of hot water. Applications: Well suited for use in tropical, sub-tropical "SunBelt", and temperate type climates where mild-to-hot temperatures exist year round and conventional water heaters are always used - and free hot water is desired or required. Performance: Hot water output is dependant on available solar radiation. Backup provides constant supply when solar performance is temporarily interrupted by inclement weather. Control Valve: A manual 2-Way plumbing configuration allows for isolation of the ProgressivTube system for maintenance or winterizing, and is typically adjusted on a seasonal basis only.